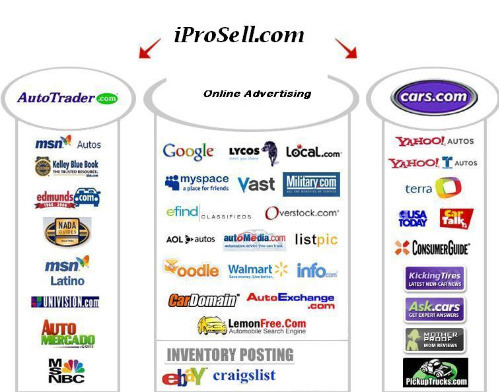 My first online advertising system was IProsell. I manually post because I dont like to spend money. Using IProSell I have done well enough during these tough times to be able to purchase my own lot. I was recently told by another dealer nearby about a cheaper system that "Does all the same things" plus put my inventory on their website also. I am all for saving a few bucks, so I decided to test it out. I used both systems for two months to compare. I posted manually using both systems and tracked the results before making a decision. I can tell you that my website traffic, lead traffic and overall results were significantly better with IProSell. I estimate that the Ben Franklin saved would cost my dealership several $1000's per month of lost income. I don't like to spend money if I don't have to. In my case, I made the comparison and found it well worth spending a little bit more to sell an extra few cars a month! To all you used car dealers located near me, It is good to be cheap, I would rather have the customers come see me. Customized Craigslist Ad Templates to give dealer unique look. Optional Graphic Banner on Ads to brand dealers ads.